The air is getting colder, the espresso is getting warmer, and Granville street is full of middle aged people whom all look like SFU professors of art history. It must be film fest time in Vancouver again. And so my next two weeks will be full of pretentious art house flicks that no has heard of, no one cares about, and no one will ever watch. And for some reason I expect you to read what I have to say about them. Let’s begin. Satire seems to be a bit of a lost art these days. Western culture seems to be in an overly earnest period culturally speaking, which is ironic considering that I’m not sure we’ve ever been more shallow. Mads Brugger is trying to change that, one sacred cow at a time. 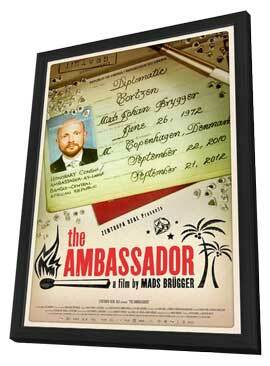 In his newest documentary The Ambassador, Brugger pulls of what might end up being the greatest documentary feat in film history. Here’s the skinny: The extremely Danish, and extremely white Brugger buys himself a diplomatic passport, travels to the Central African Republic posing as a Liberian diplomat, and attempts to use his new diplomatic immunity to ingratiate himself into the business of blood diamonds. Let’s try that again, as it bears repeating: He pretends to be a ranking government official, and then uses that “clout” to try to buy and export one of the most valuable, yet illegal substances on the planet. In Africa. With absolutely no one in on the joke. He’s defrauding two unstable, corrupt regimes, in addition to organized criminals and illicit diamond miners. Ballsy doesn’t begin to describe the sheer chutzpah Brugger displays in this film. We keep expecting a “Brugger’s Body Was Never Found” title card to pop up after almost every scene. It’s obvious that even Brugger doesn’t even know what his end game is going to be, as he tries to keep pushing the lies as far as they will go. But satire where no one gets the joke can border on sheer meanness, and in Brugger’s case, exploitation. And that’s the beauty of this film, and of Brugger’s work in general. He’s fearless as a filmmaker and provocateur. And so he makes mistakes, and often treats his subjects with a contempt that isn’t always deserved. But like a true documentarian should, he puts it all on film. He inserts himself into every situation in the same way that Michael Moore or Morgan Spurlock would. But unlike those partisan hucksters, he remains objective enough to let the camera keep rolling, even when it’s HIS mistakes that are being caught. Brugger’s mantra seems to be: everyone is bad, all the time. And so those looking for a feel good story about how Africa is on the upswing, or how your KIVA dollars are being put to good work, should probably look elsewhere. What this is, is a long look at the pervasiveness of corruption. And unfortunately, it provides no easy answers. Brugger shines lights under rocks that we barely know exist, but he entertains as well. He’s not just muckracking here, he’s entertaining. Although Mob movies seem to be an American invention, they’ve seeped into the film making idioms of countries all over the world. 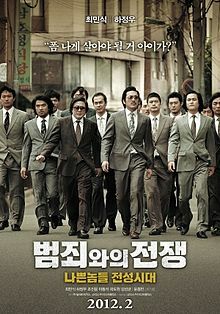 South Korea is no exception, and so we get Nameless Gangster. If you’ve ever watched Breaking Bad and wondered what it would be like in Korean, without the moral compass and competence, then you’ve got Nameless Gangster. Or at least an hour and a half of it, as that’s really how long this paint-by-numbers flick should have been. It’s a decent crime movie for sure, but not so decent that it deserved the 2 hours and 15 minutes that Yun took to make the damn thing. Min-Sik Choi (Oldboy, I Saw The Devil) gives an extremely entertaining performance as a somewhat competent dock official who manages to stumble into the world of organized crime. However, he’s hampered by a script that seems to think it’s far more convoluted than it actually is, and as such takes 45 minutes longer to get to the point than it actually does. This is moderately entertaining film, with a strong cast, and some strong production values. It’s a solid gangster movie, but it won’t be the best one I see this year. Heck, it probably won’t even be the best Korean gangster movie I see at this festival. This entry was posted in Movies and tagged VIFF. Bookmark the permalink.